For the Sponsor choosing Canada to help meet and exceed pivotal corporate objectives on their oncology trial, First Site Opened and First Patient In are critical milestones. Working with the right team on the ground to help you navigate the system and accelerate study start-up is key in unlocking Canada’s potential. When opening a new trial, many Canadian oncology investigational sites have the ability to use a multicenter approval process, commonly referred as province-wide ethics approval process. Optimally exploiting those province-specific pathways require regional experience and expertise. 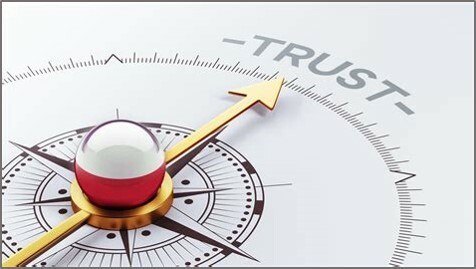 Among other critical success factors, the timely and skillful identification a “lead site” responsible for coordinating ethics approval with all other participating sites. Each Canadian province were such a province-wide approval is available has developed a similar but unique pathway. Quebec is one of Canada’s largest provinces, geographically and population-wise. Several investigational sites in Quebec possess the installations and resources necessary for the conduct of early and late phase oncology trial, as well as distinct pool of patients. In the province of Quebec, the framework for Public Health and Social Services Institutions (RSSS) to authorize research conducted in more than one site took effect on February 1st, 2015. This framework was the result of a joint initiative between the MSSS, the FRQS and 4 RUISs from Québec. It was revised on April 1st, 2016. This framework sets out the rules that enable public institutions within the RSSS to authorize a research project in their institution by recognizing the ethics review conducted by the Research Ethics Board of another institution within the RSSS. 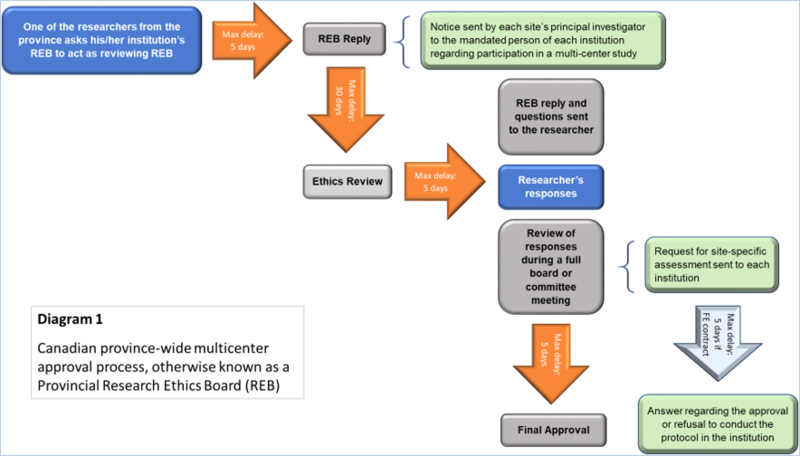 This mechanism is designed to allow the conduct of a research project at an investigational site based on the ethics and scientific review of another investigational site within the RSSS. Diagram 1 below provides a flow chart summary of the Quebec multicenter approval process. The parties involved in this process are as follows. Reviewing REB: The Research Ethics board that agrees to review a research project to be conducted in more than one public institution of the RSSS. Mandated person: The CEO of the institution or the staff member responsible for authorizing a research project in a public institution of the RSSS. Researcher: The principal clinical research investigator. 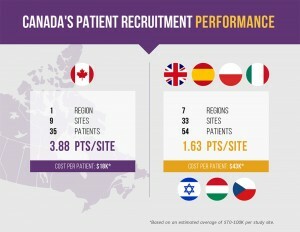 While Canada includes leading jurisdictions for cancer research with world-class researchers, the relatively smaller size of the research community and research ethics board structure facilitates a collaborative landscape with advantages in facilitating communication and collaboration and allowing trials to progress more quickly than in other larger regions. As oncology trials become increasingly complex, having region-specific oncology expertise is a critical key success factor for Sponsors involved in cancer research in the region. Although complex, the multi-center ethics approval process in effect in several provinces of Canada can save precious time if undertaken and navigated with regional expertise. 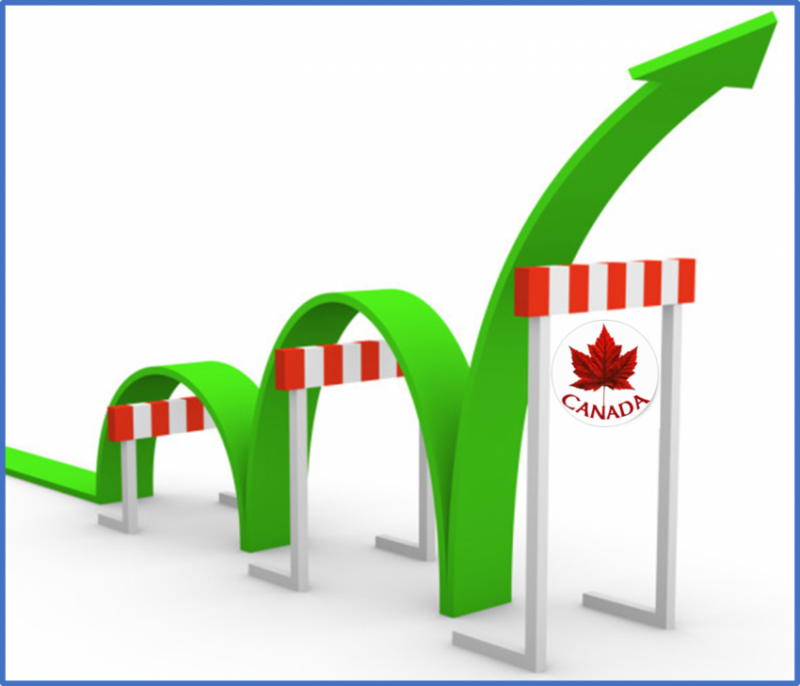 Which means a timely expansion of your oncology trial to Canada, and getting there quicker for First Site Opened and First Patient In for your phase I, II and III trials. previous post: Exploring a ‘Rescue’ Strategy for Your Oncology Clinical Trial? next post: Does Your Monitoring Vendor Hold the Key to Improving the Quality of Your Database?